With our experienced, expert team of eye doctors and cutting-edge diagnostic technologies, we supply a total range of vision and eye care services in Renton, WA. Our compassionate Renton optometrists are qualified to provide primary eye care for your entire family, from babies to seniors. We will consider your unique situation – visual needs, lifestyle preferences, medical issues, and age – to personalize eye care. By getting to know you and understanding your priorities, we can maximize your vision quality and eye health. Contact our Renton eye doctor’s office to book an eye exam; if you require urgent assistance, we also provide emergency eye care. Our Renton eye doctor performs eye exams for patients of all ages, from infants to golden-agers! When you visit our Renton eye doctor for a comprehensive eye exam, we will use leading optometric equipment to assess your visual acuity and eye health. Even if you don’t have any complaints, the early signs of eye disease can be present and detected by an eye exam. If any eye disease is diagnosed, we will recommend the most effective, progressive treatment and long-term plan to protect your vision for as long as possible. If you have diabetes, you also have an increased risk of vision damage. However, keeping your diabetes in control goes far towards keeping your vision safe! That’s why our Renton optometrist will work together with your physicians to ensure that they are informed of any ocular changes. Sometimes, a change in your inner eye tissues will point to a need for a new treatment plan for diabetes. As your caring and skilled eye doctors in Renton, we strive to promote overall well-being and healthy eyes for all people with diabetes. Seeing clearly begins with precise visual acuity testing. Our Renton optometrist will check your sight in order to provide you with a detailed vision prescription. We will then explain the options for correcting your vision, such as eyeglasses and contact lenses. The final decision about whether you want glasses or contacts will depend heavily upon your personal preferences, in addition to your eye health condition and visual expectations. If you choose to wear glasses, we offer a fantastic and fashionable array of designer frames, with a diverse collection of styles and shapes. Would you rather wear contacts? It’s easy and convenient to buy your contact lenses from our extensive inventory of premium brands. Our Renton eye doctor is also skilled in fitting ortho-k lenses, the breakthrough method of corneal reshaping that allows you to wear contacts only while you sleep. Find out if you are a good candidate for this therapy, and ask us for more info. Travel about 11 miles southeast of downtown Seattle and you’ll reach Renton, located in King County, WA. Back in the 1860s, this varied city was founded on the clay production, coal mining, and timber export industries. Now, it has plenty to offer for people seeking adventure, relaxation, family fun, great shopping, and mouthwatering eats. The Landing is a popular urban village style shopping center, with a diverse selection of historic storefronts, large retailers, and a theater. The Landing in Renton, WA, offers you more than 20 different places to dine, with a range of ethnic flavors. If you’re in the mood for good ‘ole American fare, head to Melrose Grill to savor Midwest beef or try Peyrassol Café for fresh, locally sourced food. 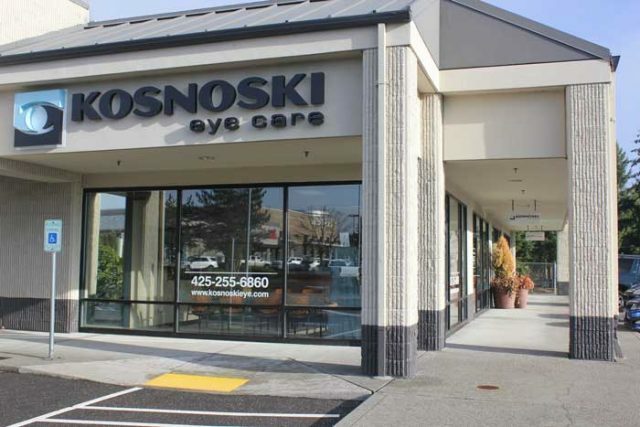 From The Landing, you can reach Kosnoski Eye Care with an easy ten-minute drive along WA 169 S and 140th Way SE. The Renton History Museum will give you an interesting view of the heritage of this region. Photographs and other memorabilia tell the story of the original settlers, all displayed within a 1942 Art Deco firehouse. Another historic site in Renton is the grave of Jimi Hendrix, music icon. Pay homage to the exceptional guitarist with a stop at this memorial. For an enjoyable night out, our eye doctors recommend catching a show at the Renton Civic Theatre. Founded in 1987, this professional performing arts center is housed within a movie palace from the 1920s. The Renton Carco Theatre is another comfortable place to be entertained by quality talent. This 300-seat auditorium is set within Cedar River Park and is a non-profit that supports education for the underprivileged. The Gene Coulon Memorial Beach Park is a favorite spot for both locals and visitors to Renton to spend time in nature. Located on the southeast shore of Lake Washington, it invites people to explore 57 acres of parkland and 5,400 feet of shoreline. A myriad of land and water-based activities await! Think about picnics, volleyball courts, swimming, walking trails, bird watching, fishing, botanical beauty, and playground installations – and you’ll have a clear vision of Renton’s popular park.